Welcome back! I hope you had a lovely half term break. This week the children have been creating firework pictures using chalk on black paper. 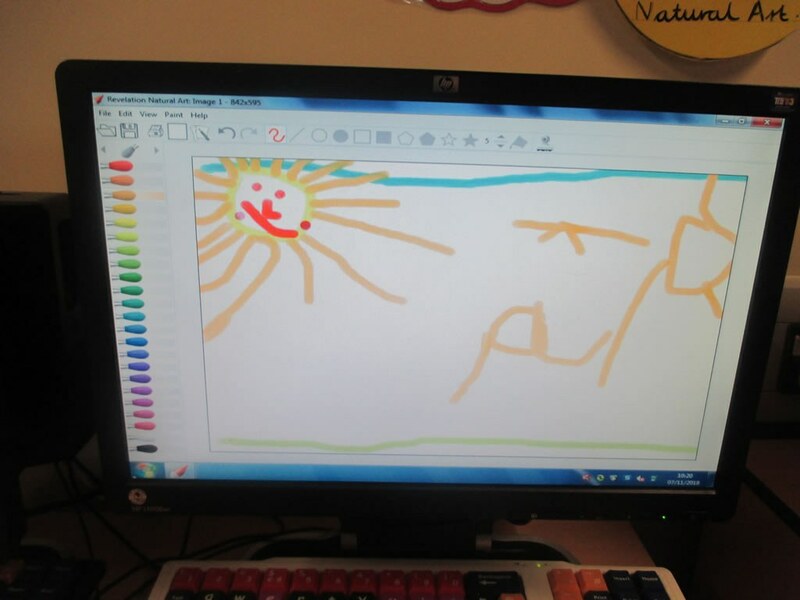 They have also been learning how to use the program Revelation Natural Art to create pictures. In their child initiated learning the children have been building rockets using various construction resources. On Terrific Tuesday the children loved taking part in art themed activities based on fireworks with parents and grandparents. Thank you to everyone who came along to take part! In Maths this week the children have been using the part part whole model to find numbers 'hidden' within numbers e.g. I can see the numbers 4 and 3 hiding in the number 7. Bailey was chosen to take Tiger home this week. Well done! 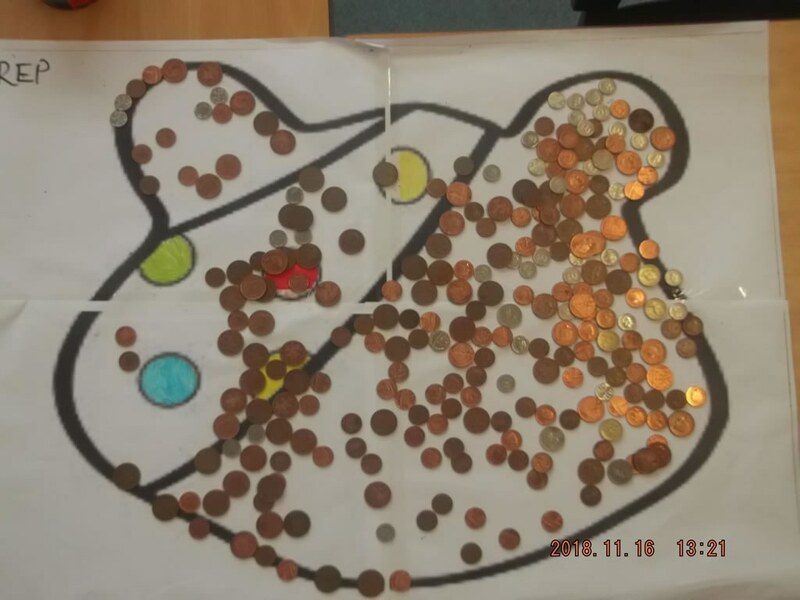 Over the past two weeks the children have been focusing on the story 'Threadbear'. They have been learning to retell the story using Talk for Write actions. The children have story mapped the story and the next step for the children is to write some sounds about the story. 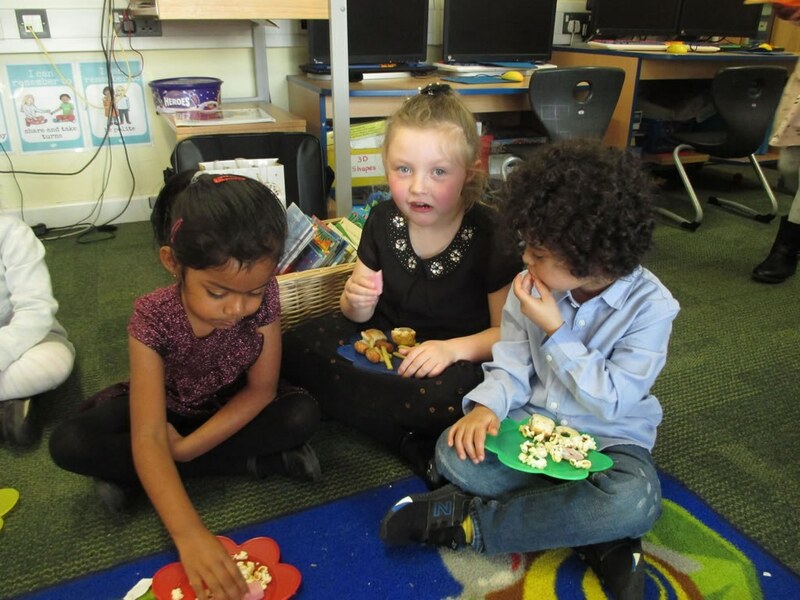 In Maths the children have been learning to add using counters and a ten frame. They have also been learning to record a number sentence. 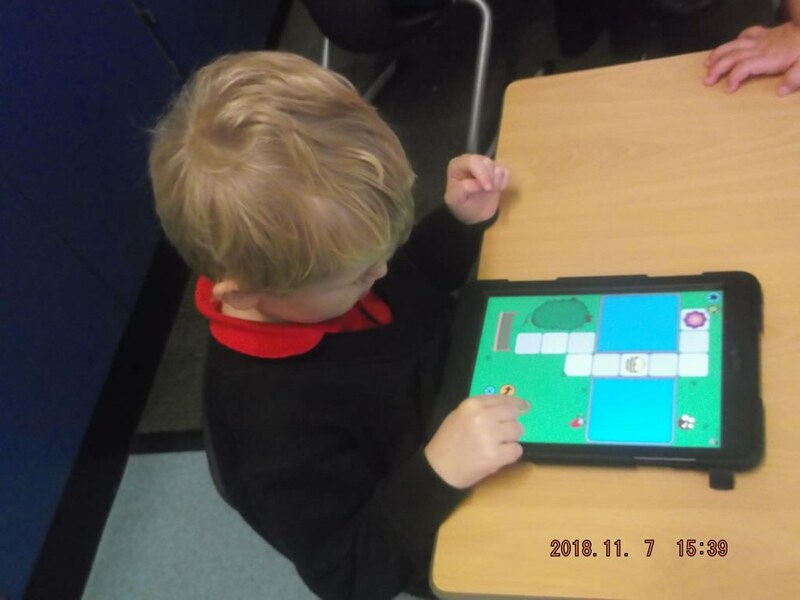 The children have enjoyed exploring how to use the iPads. They have been using the Bee Bot App to direct a Bee Bot around a maze. The children have been using directional language to instruct their Bee Bots. 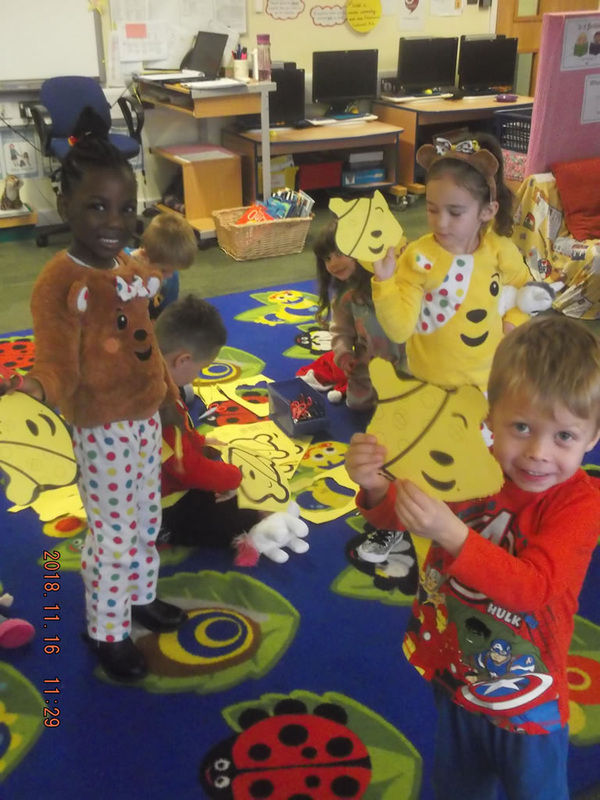 The children also enjoyed taking part in various activities for Children In Need. They made Pudsey masks and painted pictures of Pudsey. Alex was awarded the Star Achievement certificate for his excellent listening. Well done! This week the stage was put up in the hall and the children have started practising for the Christmas Nativity. They are very excited about this! Please can you continue to help your child learn their lines off by heart and to practise projecting their voices. In class this week the children have been using their sounds to retell the story of 'Threadbear'. In their child initiated learning they have been drawing pictures of Threadbear and acting out being in the role of the shop keeper/customer in our toy workshop. 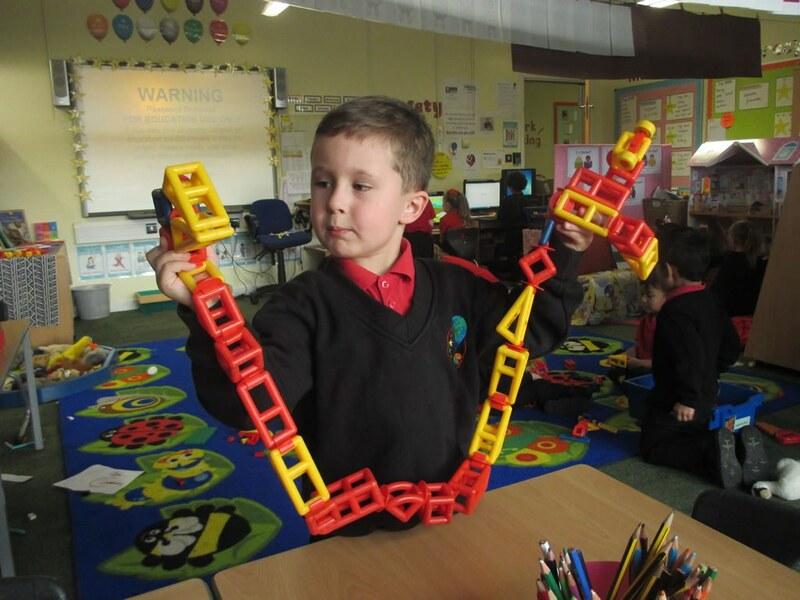 In Maths this week the children have been learning to name and describe 2D shapes. Poppy was chosen to have the Star achievement award for always listening carefully. Well done! This week the children have been writing sounds and drawing pictures to retell the story of 'Threadbear'. The children have learnt the story so well and I have been so impressed with their oral retelling of the story using Talk for Write actions! In Maths this week the children have been learning to create repeating patterns using 2D shapes. Some children have challenged themselves to change the orientation of their 2D shapes to create repeating patterns. Our role play area has turned into Santa's toy workshop! In their child initiated learning the children have enjoyed making toys and practising their wrapping skills! Our nativity performances are next Tuesday at 9:30am and 2:00pm. We look forward to seeing you there! On Tuesday 11th December the children performed their Christmas Nativity along with the other Reception class and Nursery. The children did an amazing job and said their lines so loudly and clearly! I am so proud of them. A huge thank you to all parents/carers to came to watch! This week the children have been writing and making Christmas cards and they have started making Christmas calendars too. Next Wednesday we have our Christmas party and your child can wear their party clothes. The last two days of term your child can wear non school uniform. This week the children have written letters to Father Christmas. On Tuesday the children attended the carol service at the Church and on Wednesday we had our Christmas party. 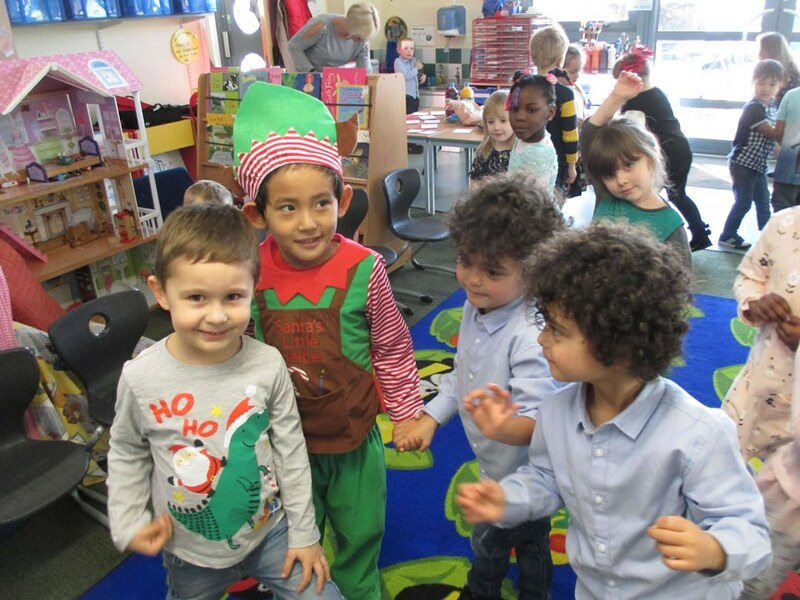 The children loved coming to school in their party clothes and dancing to Christmas tunes! 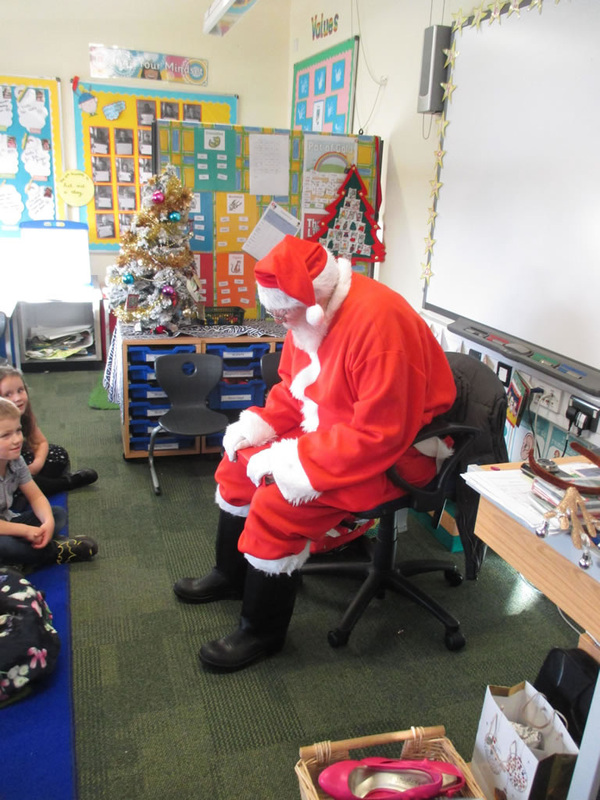 We were very lucky to have a special visitor drop by too. Father Christmas came and gave everyone a present! Have a lovely Christmas break!